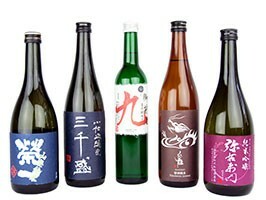 Our Brewery Sake Selection brings you one sake from each of our seven breweries. Each sake has been chosen to best highlight and the respective brewery’s unique style; this way you’ll really get a feel for the brewery you like. This is a great way to try and variety of sakes of different styles and then hone your preferences from there. Purple Warrior– a funky Yamahai Junmai from Hayashi Honten. Think: caramel & cooked fruits crumble; rich flavour. Rare Brew – a delicate and dry Junmai Daiginjo from Michsakari. Think: clear, dry, refreshing. Rocky Mountain – a flavourful Junmai Bodaimoto from Tsuji Honten. Think: rustic, raw and earthy. Gentle Breeze – a wonderful Junmai Ginjo from Kimura Shuzo. Think: delicious, fresh, fruity & light. Silent Forest – a rich Junmai Ginjo from Yamatogawa Shuzo. Think: apple tart flavours. Konishi Silver – a light a delicate Ginjo from Konishi Shuzo. Think: light, delicate, refreshing with lower alcohol. Tatenokawa 50 “Stream” – a impressing and expressive Junmai Daiginjo from Tatenokawa. Think: fruity, expressive & crisp.